Fundamental for increases in size, strength, and endurance, the importance of nitric oxide production in the body cannot be overstated. Supplements are the key to ensuring a constant supply of N.O. to the muscle cells that need it most. Force Factor’s VolcaNO promises to deliver the ingredients you need for the pump you want. Let’s take a look at how this supplement stacks up. Before we run down the list of ingredients, it’s important to note that Force Factor markets this supplement as a nitric oxide booster. This will be the focus of my review. If an ingredient is a terrific overall workout supplement but plays no part in nitric oxide production, I will be letting you know. B6 is a jack-of-all-trades vitamin as it plays an important role in a variety of processes throughout the body including converting food into energy and helping with fat metabolism. When it comes to nitric oxide production, Vitamin B6, along with several other B-vitamins, help to support this process by preparing the cells to respond more efficiently. Overall, a great start to an N.O. booster. A non-essential amino acid, L-Citrulline is an excellent ingredient for pre, intra, and post workout. 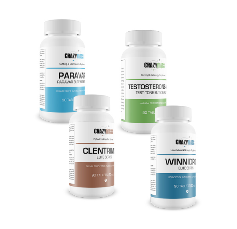 L-Citrulline provides you with energy before and during your workouts by being converted into adenosine triphosphate, or ATP. This form of energy is highly efficient and can be used rapidly. The more that is readily available for your body to use, the more fuel you have for extra time under tension. This results in greater muscular hypertrophy for gains in size, strength, and endurance. Best of all, it is a known nitric oxide booster. Again, another great ingredient. Recent studies have placed this amino acid byproduct in a favorite light. Created from L-Arginine, Agmatine Sulfate is currently being used for a variety of medical ailments including stroke and cognitive decline. Thankfully, it has also made its way into the world of bodybuilding as a supplement. Agmatine Sulfate helps to inhibit nitric oxide synthase activity resulting in a greater amount of usable nitric oxide in the blood. The biggest notable difference will be the pumps you feel. Three for three, let’s keep it up. Created from the branched chain amino acid, Valine, L-Norvaline helps to increase nitric oxide levels in the blood. The way it does this is through inhibiting an enzyme called Arginase. This enzyme has been shown to find and break down L-Arginine. If you’ve read any of my other reviews on a supplement containing L-Arginine, you will know just how important it is. L-Arginine dramatically increases the amount of nitric oxide in the blood. By stopping Arginase from destroying L-Arginine, L-Norvaline ensures a constant and plentiful supply of nitric oxide. Also known as Creatine HCL, this is a version of the classic that may be strictly marketing driven. Creatine HCL is simply Creatine bonded with a hydrochloric acid molecule. While marketing claims that less is needed for the same results, research has yet to prove this. Still, it is a form of Creatine and with it comes the wonderful benefits. Creatine is directly converted in ATP. As mentioned above, this is the muscle’s preferred fuel source during heavy lifting. However, Creatine does NOT directly increase nitric oxide production. At the same time, it will supply your body with an increased fuel supply to maximize time under tension; thereby, allowing your muscle cells to soak up the nitric oxide in your system via the other ingredients. Much like L- Norvaline, this amino acid precursor helps by helping others. It’s needed to make L-Taurine, which is an amino acid known to lower cortisol levels in the blood, protect from protein breakdown, and inhibit nitric oxide synthase. As I mentioned above, by inhibiting nitric oxide synthase, you allow for a larger amount of usable nitric oxide in the muscle cells. It’s also used to create L-Carnitine, an amino acid that encourages the production of growth hormones. While L-Glycine is a terrific workout supplement for a variety of reasons, I’m confused as to why Force Factor placed this version in their supplement. Like Creatine, there are multiple forms of different amino acids, many of which have been bonded with specific molecules. Here’s the issue: It is known throughout the supplement industry that Glycine Propionyl-L-Carnitine, or GPLC, is the form of L-Glycine that encourages nitric oxide production. Not L-Glycine. Again, I’m not knocking L-Gyncine. It has been shown to help create Creatine in the body and encourage an increase in growth hormone levels. Unfortunately, it does not play a role in nitric oxide production. Still, not a bad ingredient to have in a pre-workout. I experienced a major pump, which is common with an N.O. booster, during exercise but only when I doubled the serving size. I noticed faster recovery between sets of weighted exercises and sprints. I also noticed that I was recovering faster post-workout as I was not as sore. While I did notice an increase in the amount of volume, sets, and repetitions I was able to perform, I don’t know if I can attribute this to the supplement as much as the standard improvements most guys push for from week to week. Still, it’s worth noting. 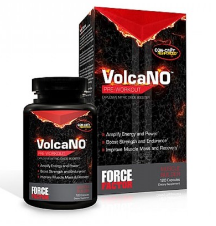 Force Factor’s new formula for VolcaNO definitely makes it a worthwhile supplement. Most of the ingredients directly support nitric oxide production and even the ones that don’t have a part to play. My concern is the price and the serving sizes. For veteran lifters, you’ll need to double the dose to feel the difference. This effectively turns a two-month supply into a one-month supply for the price of $69.99 plus tax and shipping and handling. Never mind the fact that they recommend taking it twice a day. If you are new to the supplement realm, then give it a try as you might feel the pump from one serving size. I can recommend the ingredients but not the price of the product. For the same amount of money, you can buy each of these ingredients individually. "How To Get Lean, Ripped, and Strong Quickly"
Check out my real Nitrocut review, and learn about my results. Read my personal review of the Crazy Mass cutting stack. Amino Prime is reportedly used to help invigorate sexual health and build rock hard muscle. Nitrocut is the most effective stimulant-free pre workout supplement I've ever tried. Click Here to read my personal review and results. Maximum Shred Review – Does It Work? Superior Muscle X Review – Does It Really Work?